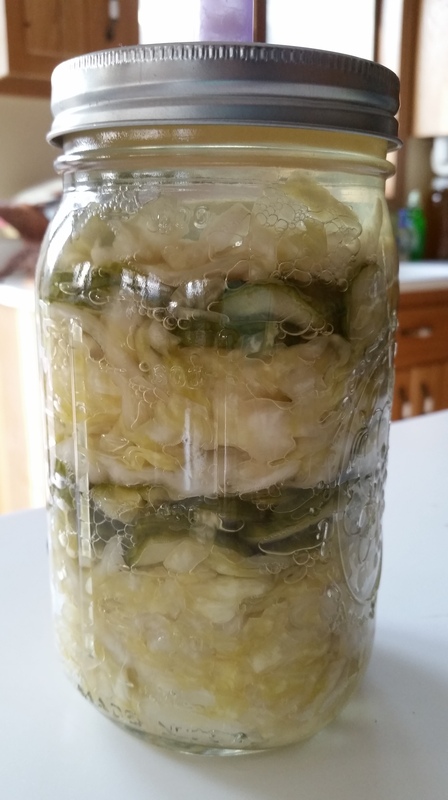 Well, my sauerkraut is finally done and it didn’t take me quite as long as I thought it would. I estimated it would take about 4-6 weeks on the counter but I tasted it at 3 weeks and I am happy with the outcome. 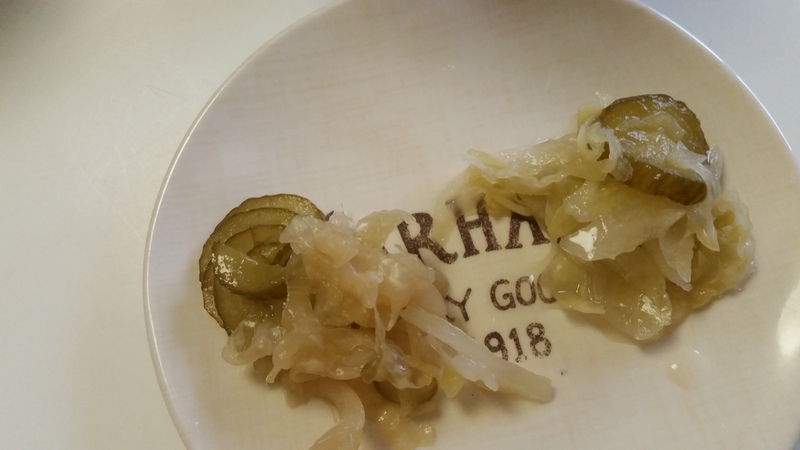 I compared the taste of the two different sauerkrauts and mine is not as crisp as the Trader Joe’s but it has a very nice flavor. I could definitely taste the garlic and I loved the addition of the cucumbers. I think next time I may omit the pounding of the cabbage and just allow it to sit and macerate. This in turn will keep the cabbage leaves crisper. Wash outer leaves of cabbage and discard spotted leaves. Slice cabbage thinly. Toss cabbage with 1 tsp of salt and set aside (about 30minutes) to allow juices time to drain. Slice cucumbers thinly and peel garlic cloves. After 3o minutes – 1 hour, toss the cabbage again until you have extracted enough liquid from the cabbage. Some sources say this step could take anywhere from 1-3 days to create enough liquid. Just cover, and toss every now and then. Next, I started layering my ingredients in the jars, packing in between layers to compress mixture and extract more liquid. Once the jar was filled 2 inches from the very top I pounded once more to make sure there was enough liquid to cover the ingredients. Place a weight to keep food submerged. Any food exposed to air increases the risk for mold. I am sure some people have different tips that have worked for them during fermentaion but here are a few I have found from my reading and small amount of experience. A lot sources I have read recommend bone broth to heal the damaged lining of the gut which occurs in many autoimmune disorders. I have mentioned before that I suffer from autoimmune hypothyroid disease called Hashimoto’s. Bone broth, made from the bones of chicken helps to seal the gut and aid in proper digestion thanks to essential amino acids, minerals and gelatin found in chicken bones. The gelatin acts like a thickening agent and attracts liquids and digestive juices and holds them in place to ‘seal’ the gut. Cool, huh? I have been incorporating this broth into my weekly regime of healing foods. It is easy to make and has enormous health benefits including immune boosting properties. I hope that you will give it a try. Combine all ingredients in crockpot on low 6 hours or over night. Mash chicken bones with masher and allow broth to cool to room temperature. Strain solids using an old clean t-shirt or fine mesh strainer. Squeeze to extract all the liquid. Store in the fridge for up to 2 weeks. I make bone broth every week. On Sunday’s I roast a whole chicken for dinner while we are at church.After we eat, I throw the bones in the crockpot with the remaining ingredients. Don’t forget to drink the film / skin on top. It is full of nutrients. I don’t know if any of you are sauerkraut fans but this kind sold by Trader Joe’s is AMAZING! I can’t seem to get enough of it but for 5 dollars a container it will break my bank. My problem is I can’t stop at one teaspoon. I could literally eat the whole container in one sitting. So, I am making my own version and crossing my finger that this works. Aside from making Kombucha (fermented tea) every week, this will be my first ferment. If you have never made Kombucha or tried it, RUN to the store and get some. It has a wonderful tart/ sweet flavor with fizzy soda-like qualities. Totally addicting and here is the kicker…it’s healthy! My husband and kids (okay, only one kid) love it. But seriously, it is a miracle that my husband is on board. He goes through a few boxes of movie theater candy a week. That is anywhere from 100-150 boxes of candy a year! He has a major sweet tooth!! DAY 3: Look at those bubbles!! Bubbles equal fermentation. My Dr. has recommended I ‘eat’ my Probiotics instead of supplementing them. 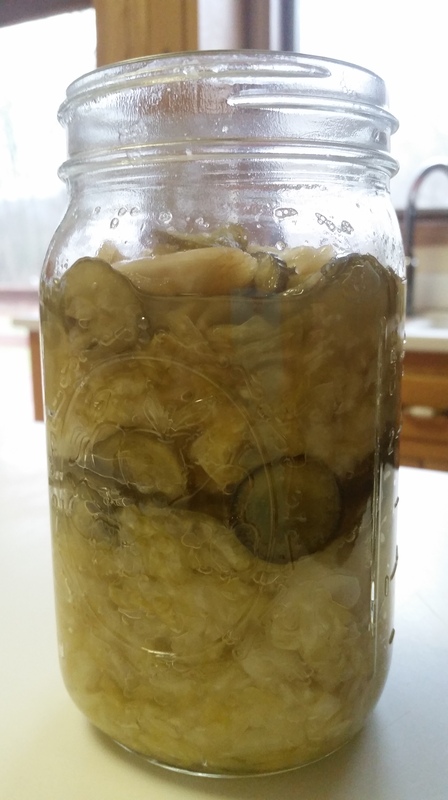 Fermented foods are an amazing way to build good gut health and fill your gut with healthy bacteria. Those healthy bacteria get bred during the process of fermentation. Not only do they aid in digestion, those little buggers also help build immunity. By eating only a tablespoon each of different strains of probiotics per day, I can protect myself the same way, if not better, as if I was taking a store bought probiotic supplement. I have autoimmune hypothyroid disease called Hashimoto’s Thyroiditis.I have battled with years of stomach and gastrointestinal problems (IBS), among a few other issues. I am a registered nurse and have seen the way pharmaceuticals have wreaked havoc on the health of our current society. I am convinced that going back to the old-fashioned way of preparing food and treating minor illnesses could alleviate obesity, many autoimmune disorders as well as the overuse of antibiotics that we are now experiencing. My personal goal is to lower my antibodies to where I can become drug-free and restore my gut health. I intend to share my journey with you and hopefully at the same time encourage you to implement some of these amazing foods into your daily lifestyle. I have finally had time to indulge in Pin interest. Can I just say it is addicting and fun. I love how you can search through pictures, click on the one you like and go right to the website of origin. I love that you can put pictures of all different subjects together on one board. I found this awesome Blueberry Buttermilk Breakfast Cake on Pin Interest. I had it ready for hubby when he and the little men came home from church this afternoon. Hope you find some yummy things to make this week, edible or non-edible. I usually do not share anything other than crafting but today I cannot resist. Hunky hubby and I are going out to dinner at the Cheesecake Factory tonight with another couple. My best friend has graciously offered to babysit so I have been cleaning like mad. I also baked a Apple Pie. Lets just say my house smells yummm. A clean house and pie… that’s a profitable day. I am not a photographer but I had to show you how it turned out. Too bad you can’t smell it. I have an awesome crust recipe that turns out so flakey and tasty.